How would you like to hear the United States Secretary of State say this about you? 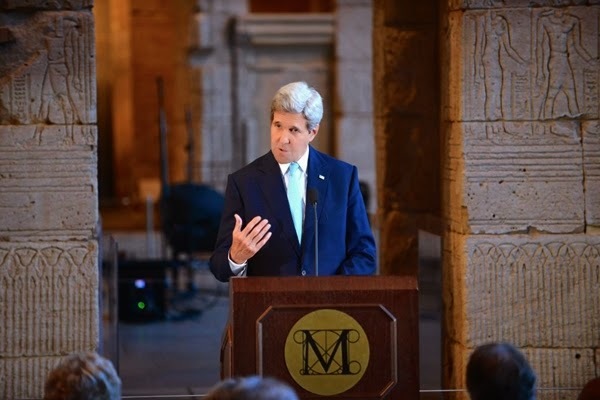 That was Secretary John Kerry addressing the crowd at a State Department event to underscore the threats to cultural heritage in Iraq and Syria at the Metropolitan Museum of Art in New York. It was a proud night for our colleagues at ASOR. Under the leadership of Executive Director Andy Vaughn and Professor Michael Danti of Boston University, a dedicated team of American and Syrian scholars is working with the State Department on the Syrian Heritage Initiative. The SHI is a cooperative effort to document comprehensively the current condition of cultural heritage sites in Syria and assess future restoration, preservation, and protection needs. ASOR is taking the lead in the struggle to protect the cultural heritage of war-torn Syria. ASOR is an original partner in the Antiquities Coalition, supporting our efforts to fight cultural racketeering and to promote and protect the world’s cultural heritage since we began. They are stalwart collaborators and their own efforts in the Middle East clearly impressed the Secretary. At the event on Monday, I saw Andy Vaughn at the reception afterwards as he smiled and humbly accepted compliments and congratulations from the assembled, allowing that Secretary Kerry’s encomium was “pretty cool,” while pointing out that there was still much to be done for the cause of safeguarding Syrian and Iraqi cultural patrimony. Other leaders of the Syrian Heritage Initiative are Scott Branting (ASOR), Jesse Casana (University of Arkansas), Abdal-Razzaq Moaz (Indiana University and ASOR), and LeeAnn Barnes Gordon (ASOR).